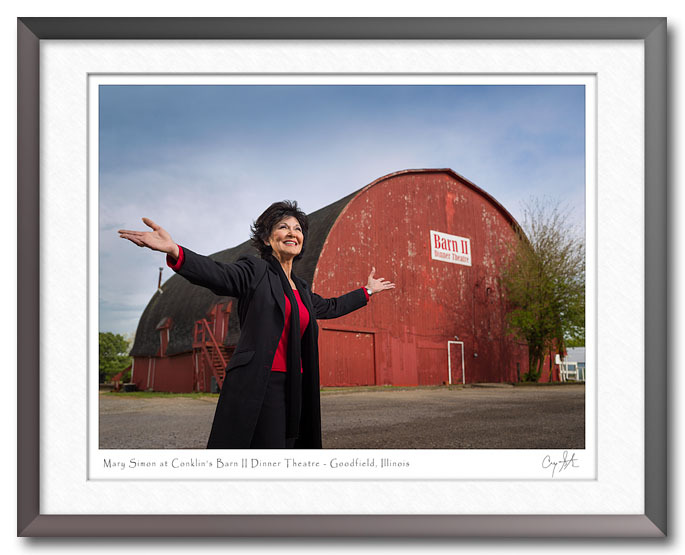 Mary Simon of Conklin’s Barn II Dinner Theatre in Goodfield is the latest entertainer to be featured on the Playing Peoria website. I had a great time doing her photo shoot, and it was really interesting to learn something about the person behind the characters we see on stage. I’ve also begun to collaborate with Arts Partners of Central Illinois. They are putting together a set of photos featuring local artists for National Arts and Humanities Month in October, so my photos can now have a dual purpose. They are also helping to promote Playing Peoria on the Arts Partners Facebook page. I have a passion to create, and I'm fascinated with the tools and technologies of creativity. I strive to produce images that are graphically simple and technically precise in order to render beautiful photographic fine art prints. I work with a variety of digital transformations to create a finished image that reflects my artistic interpretation. This entry was posted in Playing Peoria, Recent Work. Bookmark the permalink.